The APS Times annual Asia Pacific Superyachts 16-page full-colour newspaper was distributed by APS agents to yachting visitors at the recent Monaco Yacht Show. If you missed the Sept. 26-29 MYS event, you can still collect your free newspaper here. As the Monaco Yacht Show came to an end all the yachts at the event blew their horns to mark the closing and the APS team of owner agents, representing 18 branches in 16 countries, were there to celebrate, noting: “We all had a great time and it was wonderful to meet many superyacht owners and captains with a keen interest in visiting or returning to APS regions in our regions”. Visitors enjoyed cold drinks and informative chats with agents when receiving their APS Times. One lucky winner was awarded a bottle of wine at the APS Stand every day! Set in the iconic Port Hercules in the principality of Monaco, the Monaco Yacht Show represents the pinnacle of luxury, presenting this year an exhibition of 125+ extraordinary one-off superyachts built by the world’s most respected shipyards and welcomes leaders from the yachting industry. Forty or so new launches are annually unveiled in a worldwide debut at the event, with 580 exhibiting companies and partners participating in MYS. APS fits perfectly at the ultimate showcase along with industry influencers from the most reputable superyacht builders, award-winning yacht designers, luxury suppliers, influential brokerage houses, water toys, prestige cars, helicopter and private jet manufacturers. 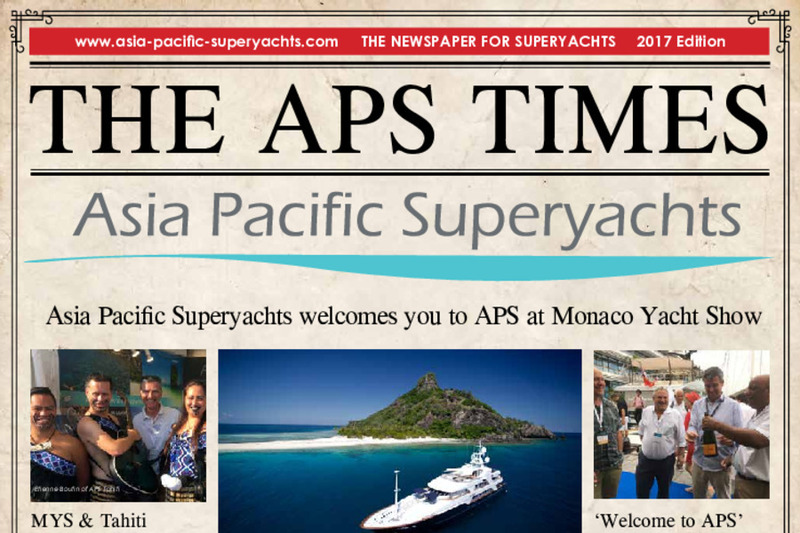 The leading superyacht services agency in Asia Pacific was delighted to introduce the 2nd annual APS Times Newspaper, bringing new government and destination developments, changes, itineraries and tips to event visitors. APS plans to return to MYS, the premier luxury event worldwide where visitors find needed information & news on superyachting against the glamorous backdrop of Monaco. Available online is the updated APS company brochure and region brochures along with the APS Times newspaper.